Intel showcased its tiny Compute Stick at last year's Consumer Electronics Show. Unbeknownst at the time, the portable HDMI PC would inspire a whole new category of computers and spawn numerous me-too devices. The Compute Stick has returned for its second CES, this time packing much more powerful hardware that addresses one of the original's weak points - processing power. Two of the three new Compute Sticks are powered by Intel Core M processors. Specifically, there will be a SKU with a Core m3-6Y30 processor and one featuring a faster Core m5-6Y57 vPro processor. Both models will include 4GB of RAM, 64GB of eMMC storage, dual-band 802.11ac Wi-Fi and Bluetooth 4.1. 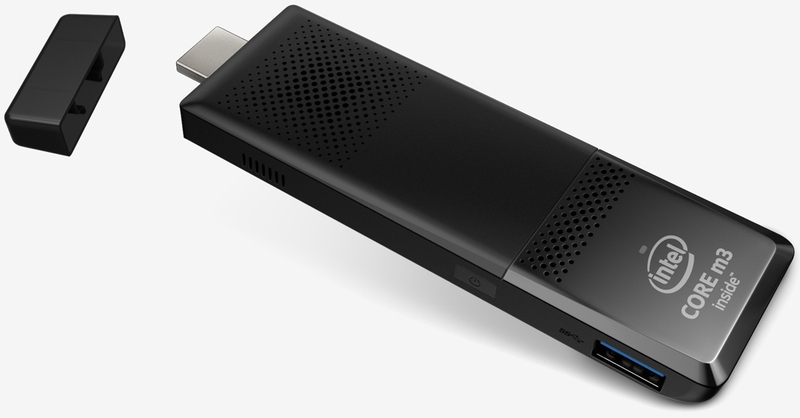 In addition to the HDMI connection, these new Compute Sticks will have three USB ports (last year's model offered just one USB port). Intel hasn't forgotten about its Atom-powered Compute Stick. The refreshed entry-level model is powered by an Intel Atom x5-Z8300 quad-core processor alongside 2GB of RAM and 32GB of eMMC flash storage. It also packs in dual-band 802.11ac Wi-Fi, Bluetooth 4.0 with 2x2 antennas and two USB ports. Intel lists the MSRP for its Core m3 and Core m5 Compute Sticks at $399 and $499, respectively. It's worth pointing out that the Core m3 model comes with Windows 10 pre-installed while the more expensive Core m5 variant doesn't include an operating system. The Atom-powered Compute Stick will run you $159 with Windows 10. All models are said to be in production now although an exact launch date hasn't been provided.